My passion for Africa started when I was in my teens. I was worshipping God with my future husband, Kevin, up on a mountain, when all of a sudden, I was transported through an open vision to Africa, where a large sun was setting and the grass was swaying on the horizon. In the vision, I was in a helicopter, riding low to the ground, and was carrying supplies for this large wagon I saw in the distance. As we got closer, I saw myself on this wagon, which was full of barrels filled with precious goods intended to feed the hungry masses awaiting our arrival. Then, the long grass I saw at a distance turned into the outstretched hands of children and adults begging for assistance. After having this vision, I knew the setting sun represented the urgency of the hunger, and that time was running out. Ever since, I knew that I would go to Africa to help bring the resources God would give me. Many decades later, in March 2007, I was scheduled to lead a Bethel School of Supernatural Ministry team to South Africa, but had a nearly fatal fall on the ice, where I had to have brain surgery just 3 months prior to when we were to depart. I knew the enemy was trying to deter me from fulfilling my destiny. God miraculously healed me, however, and I ended up leading the trip, in which we saw over 1,100 children give their hearts to Christ. We also taught the churches about signs and wonders, and about how supernatural creativity can transform culture. Upon returning home, these churches began to send me testimonies about the fruit that was growing from our deposit of Kingdom resources. I have now gone to several countries in Africa, including South Africa many times, depositing the culture of Kingdom creativity, and have found so many wagons (churches) that are giving out the new wine! Kevin and I are now traveling the world, putting on Limitless Conferences, where the flavors of our lives merge together and we create an atmosphere, where miracles, creativity, and joy overflow to those who come. We are bringing in the resources of the Kingdom through our unique creative expressions, and teaching the Churches to express their creativity in every sphere of society through innovative ideas, strategies, inventions, and giftings. We conducted a Limitless Conference at Breakthrough Life Church, pastored by our good friends, John and Lisa Crumpton, where we had been two times before and saw the fruit of us working together for years to establish a Kingdom center that would touch all of the city and other parts of South Africa. In the first session, God gave me a prophetic picture of His heart to restore the Bride of South Africa to include all of the ethnic parts of the body (Church). One 7 year-old girl was legally blind in one of her eyes, and as Kevin breathed out to the congregation, her eye was completely healed! She went to the doctor the next day, and he couldn’t find anything wrong, except for a wrong prognosis that he had previously given! It was such an incredible time, as we saw the fruit of Breakthrough Life’s journey of expanding the Kingdom, and how they are creatively expressing the Kingdom in signs and wonders to transform Johannesburg. After our Conference, John and Lisa took us on the Safari of a lifetime! Imagine sitting outside your 5 star accommodations in the middle of a game reserve, eating on the patio where the wild animals are meandering nearby, and your bedroom faces a watering hole, where you see three rhinos drinking the first night. It was amazing to share these experiences with other people, and how the wonder of what we were witnessing in creation was fueling our connection and creative ideas, as we sat around the fire and imagined what might be lurking beyond our electric fence waiting for an opportunity to join us, as they smelled the leftovers of our perfectly barbequed fillets. Then, for at least 7 hours a day, we drove in an open Land Cruiser through reserve with a top guide, who explained each animal in detail, and then knew exactly where they would be, as we followed their tracks. For three days, as we tracked various wild animals in our truck, we saw lions, zebra, antelope, rhinos, giraffe, hippos, jackals, hyenas, monkeys, crocodiles, and elephants. It’s hard to put into words the adrenaline rush that occurs when you experience 4 lions brush past your truck coming back from a kill looking for water, or maybe another meal. We saw the power of the limitless one who created each animal so distinct in color, size, mannerisms, personality, and community. It was so incredible to us to see how they are interdependent for survival on one another. All creation gives glory to the Creator, and as we saw the magnificence of what He had created, we couldn’t but wonder at the creativity of diversity He has placed inside each one of us! Similarly, we all are so unique, different, and celebrated! We came away appreciating the diversity in creation, and how magnificent each expression of creation to reflect His glory. We then made our way to beautiful Cape Town, where creativity in the Arts is exploding! We conducted a Limitless Conference at Journey of Grace Church, where Bill and Connie Bennot are pastors, and we had an incredible time continuing to partner with them to expand the Kingdom of God in the region. We saw so much growth and health in their church community, which inspired us to take more risk in releasing the limitless presence and power of God in the charged environment. We saw so many miracles throughout the conference, and many people were activated to take risk in creating as I taught a session on Cultivating Creativity. People created through art, music, dance, and prophetic acts and then ministered to one another in the prophetic and healing. I was so encouraged to see all of the people who had been in my Create Supernaturally conferences before, or taken my e-courses, were at the forefront in taking risk, as well as encouraging others to step out into their God-given creative destiny. On Saturday night, I painted a picture of a beautiful Vineyard in Cape Town. In the middle of the vineyard, I painted a barrel with a wine bottle and a half full glass of wine on top. On the wine bottle I wrote the words, “The Father’s Blend, Limitless” which represents the fact that the Father’s barrel of limitless new wine will be what the Church in revival will carry to all of Cape Town. As I was sharing, I released the painting for healing for pain in the body, and people were getting healed as they saw the new wine of the Spirit being released. One woman, who had dystonia for 18 years (a neurological disease that affects only 1% of the population), and had been in extreme pain and discomfort to the point that her arms and neck would involuntarily go into spasms, was healed after looking at this picture. While looking at the painting, her pain level went from an 8 to a 4 and then Kevin and I release more healing, and she was completely healed. We just got word that the doctor has confirmed the miracle! 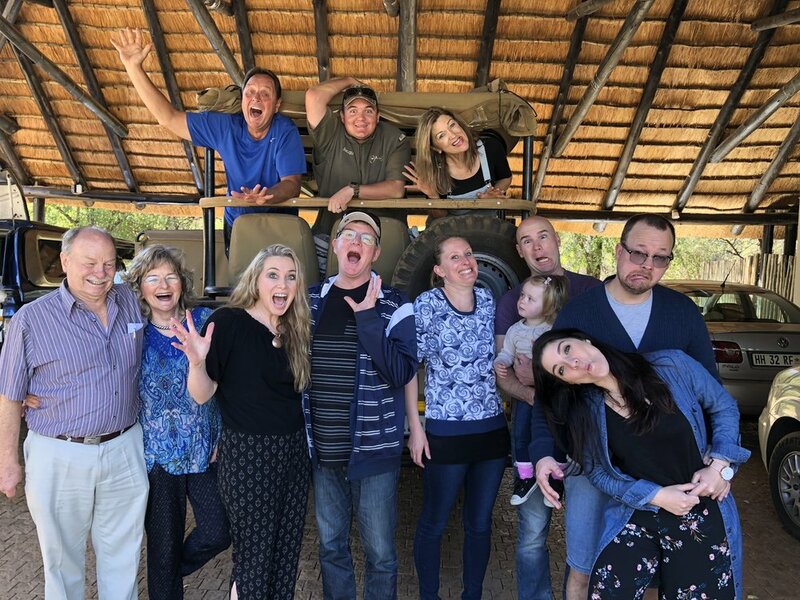 We then went to Die Bron Church on our final night, where we were hosted by pastors Gary and Rhona Kieswetter, and were so encouraged by their ministry, while we released signs and wonders, and miracles there as well. It was great to see the diversity between the two churches, yet the same creator using both of them so powerfully to impact Cape Town with the resources and creativity of Heaven. Happy adventures! Remember, you are Born to Create!